Like printers, databases have drivers, known as ODBC drivers – Open DataBase Connectivity. The purpose of these drivers is to provide an outside software tool access to the information in a database. Companies that sell databases also provide these drivers, usually free of charge. It is not required to upgrade a database and the database accessing software to 64 bits. However, the software reading the database must have an OBDC driver based on its 32 or 64-bit coding. For example, Altium Designer version 18 requires a 64-bit ODBC driver, even if the database itself is only 32-bit. 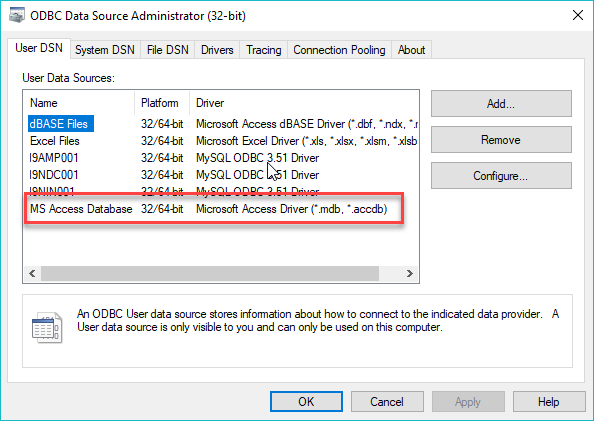 For MS Office products, the ODBC driver for MS Access is installed during Office installation. Though Windows 10 is a 64-bit operating system, the non-professional versions of MS Office are currently 32-bit. Note that even those versions of Office that are available in 64-bit will install the 32-bit by default; you have to specify the 64-bit version during setup and installation. For MS Access, if 64 bits is not listed in the ODBC, it will need to be installed. The link is available by clicking here. There are several options provided. Option 2 – Install the 64-bit Microsoft Access Database Engine (2010), alongside your existing install of 32-bit Microsoft Office is the recommended procedure. This procedure also contains a link for downloading the driver 64-bit Microsoft Access Database Engine (2010). When clicking on the link, select the language for downloading. On the next page, select AcessDatabaseEngine_X64.exe. If prompted, save the file. Do not run it. Follow the instructions provided by Altium. In Option 2, a modification will be needed for the registry. It is recommended that the name be changed rather than deleted. This is a precaution in the event other software suites using the database are impacted by this change. Next Next post: The Dedicated PCB Layout Artist – Is This a Sustainable Profession?